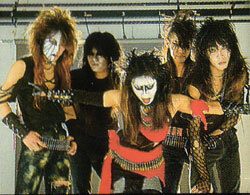 Chaotic heavy-rock band,leaded by a Chaos Queen HIZUMI,reigning as a charisma of Japanese heavy music scene of the underground. JURASSIC JADE was formed by HIZUMI,NOB and HAYA in January 1985.Firstly,the band released flexi-disk”Live at Explosion”,and joined in the compilation album”Heavy Metal Force 3″.From 1986 to 1991,JURASSIC JADE released one EP,three albums and also joined in several compilation albums.The band continued the live activities as well as now,leaded Japanese thrash metal/loud music scene. In 1996,JURASSIC JADE started their own label named “Bang Your Souls Records”,and released two albums entitled “After Killing Mam””Doku,Yume,Sperm”from this label. After releasing “Wonderful Monument”album from Howling Bull Records,the present bass-guitar player GEORGE joined the band in 2001.After that,JURASSIC JADE recorded their 7th album entitled”Left Eye”,and released from Howling Bull Records in October 2004. In 2005,the band contracted with B.T.H. records and released “The Early Days 1985-1988″(CD+DVD). This album is re-issue of “Live at Explosion” “A Cradle Song” “War by Proxy” as CD,and DVD of ealry day’s live-show. After that,JURASSIC JADE joined in compilation album”Tribute to Garlic Boys”,and released mini-album entitled “Hemiplegia” in 2006, “Endoplasm” in 2008.